I have to keep up with so many different things everyday. My husband’s schedule and the kid’s activities change weekly, but I can’t remember the last time we didn’t have something scheduled at least three nights of the week. To keep track of everything I use a paper planner and my phone calendar. In the past, I’ve used an Erin Condren life planner. It was perfect when I didn’t work and the kids activities were pretty consistent. 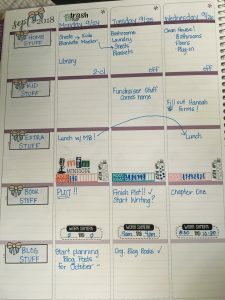 This year I switched to the Erin Condren teacher planner. 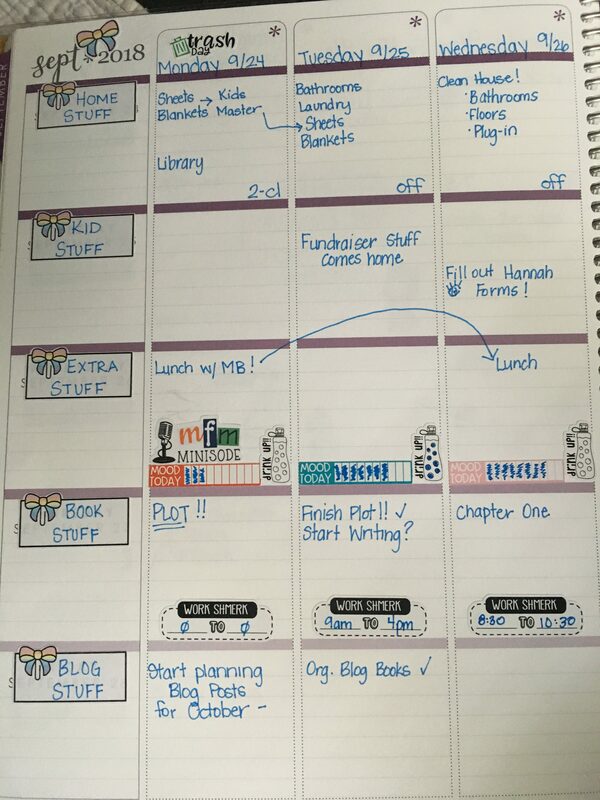 I modify each week to fit my needs with categories like – Home, Kids, Chores/Extra, Book, and Blog. It is an 8×11 planner and the perfect size for life with three busy teenagers, a busy husband and working from home. In addition to my planner, I use several other tools to keep myself on track. I use post-it notes (I should seriously own stock in 3M), colored pens, and stickers. The stickers are mainly used to keep my planner pretty, but some are functional. My other life-saving organizational tool is my desk calendar. It’s also from Erin Condren. I keep a running list on the side of things that are happening the next month and make sure to write in all appointments and already scheduled stuff at the beginning of every month.